There is no grave marker for Alice Martin Bishop, nor her three daughters. We can’t tell you where George Clarke or Richard Bishop is buried — not the town or cemetery. Matter of fact, given her crime, Alice may be buried in an unmarked grave far from her family and neighbors. During our 2014 trip to Massachusetts, I think Kristin and I were moved most by the graveyards, knowing these spaces were the closest we would ever get to our ancestors. Together, we visited the Witch Trials Memorial and The Burying Point Cemetery in Salem, Cove Burying Ground at Eastham, Cobb’s Hill Cemetery in Barnstable (at the First Unitarian Church) and Burial Hill in Plymouth. Kristin also took the opportunity to visit the graves of Abigail Adams and John Winthrop while she was in Massachusetts. Legible headstones before 1700 are rare. The earliest grave markers were made of wood and have, naturally, not survived. As stone cutters came to the colonies, their work included memorials, but many of these have faded or crumbled thanks to erosion, lichen, vandals, and robbers. Yes, vandals and robbers. For decades now, some of our oldest cemeteries’ gravestones have been stolen, defaced, and used as lawn chairs and ashtrays. Charming, America. Historians’ perceptions of the Pilgrims and life in Plymouth Colony evolve as discoveries are made — previously unpublished probate inventories shed light on what the colonists wore or owned, freshly unearthed archaeological finds provide insight into the buildings that housed those colonists, or the items they used to conduct the business of daily living. 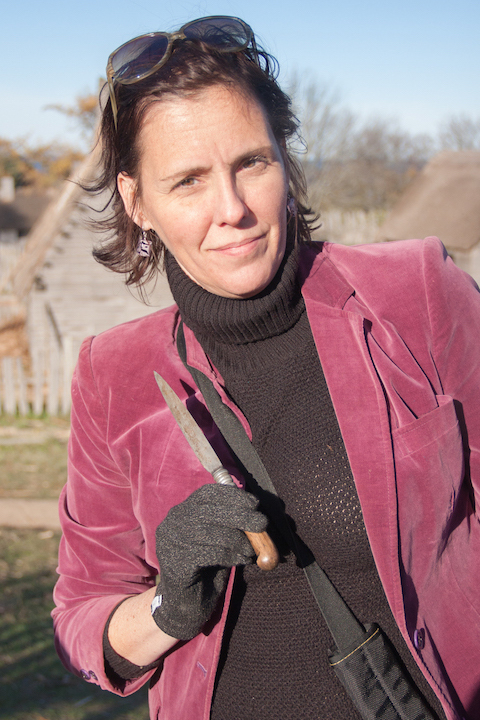 Our recent trip to Plimoth Plantation allowed us to peek through a re-created window into Alice Martin Bishop’s world, and gave us a sharper focus on the tool that is at the heart of her crime – the knife. What we previously assumed to be a crude and rare item turns out to have been a common household possession. All men would have had their own knife, and most goodwives would have owned one as well — or possibly shared one if more than one adult female lived in the household. AMB on Who Is Alice Martin Bishop?